A two-storey home that focuses on relaxation Which part of the house did you like the most? Today we are visiting a charming villa that's both classy and comfy. 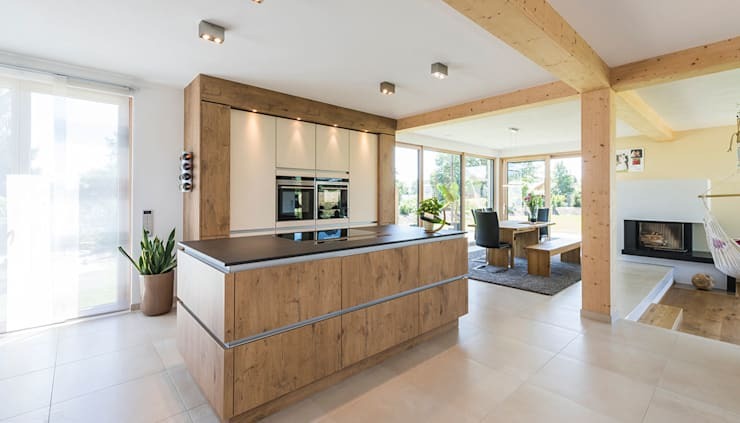 A dream house that is designed by the architects from Kitzlingerhaus Gmbh, a group who so brilliantly created an energy efficient home. This home pretty much offers everything that a person needs in a home. Let's take a closer look at this villa! If you look at the exterior of the house, it would appear as if it were little, but when you examine the house as a whole, you'll see that it is actually much bigger. The impressive exterior is fashioned with white walls and dark-coloured borders for the windows. The designer also used wood material for the car garage with an automated gate and the grey corner of the house that holds the patio underneath and the balcony above it. This spacious home is designed with a white ceiling and walls with wood details such as the beams, doors, staircase and furniture. The living room is separated by steps with a nice warm-coloured wooden floor whereas the kitchen and the dining is built with cream-toned tiles. Along the dining room is a wide glass sliding door leading to the patio. The combination of wood and modern design provides an updated and natural atmosphere to the villa. The open floor plan provides ease with a light and airy atmosphere to the home. This wonderful kitchen is very accessible that you can easily entertain guests while cooking. Its modern and stylish design is sleek with wood details that give it a warm touch. It has ample lighting and a spacious center island that make this space suitable for preparing dishes. 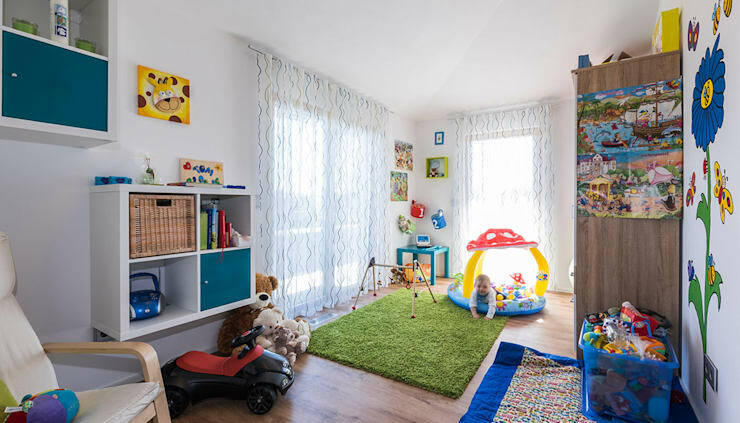 A bright children's room with large glass sliding doors that lead to the garden. The green carpet bring that outdoorsy feel into the space, giving it a fun and whimsical vibe. It also provides a cushion for children to crawl in and learn to take their first steps. This charming patio has a rustic appeal with the wood material used for the floor, ceiling and the wall. Having pin-lights projecting up from the floor creates a warm and dramatic effect that makes this space very cozy. 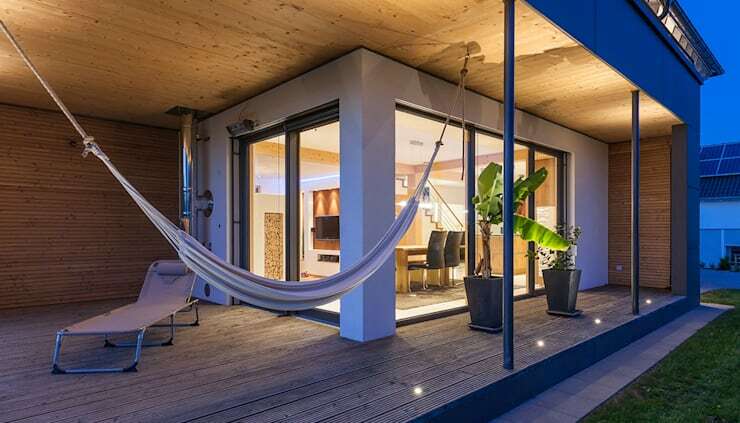 It's a perfect spot for a siesta along the hammock where you get to feel the fresh breeze as you relax in your beautiful home.